This entry was posted in Transition, Waste & Recycling and tagged East Metropolitan Regional Council, emrc, Hazelmere, Mattress recycling, Pyrolysis plant, Tip shop. Bookmark the permalink. Pyrolysis is a form of incineration which requires the highest assessment for health and environment protection. Biochar is not a proven benefit for agriculture and organic material is better composted than burnt. The East metro region does not need anymore air quality threats as it is already disproportionately burdened with brickwork emissions. I am shocked that this proposal has been slipped through without stakeholders who have engaged with the EMRC for more than 12 years being kept in the dark. Australia does not currently have any regulatory framework for this industry yet they are being promoted heavily by certain politicians and misinformed groups. Please make yourself informed of the serious problems that these projects bring at both a local and global scale. Biomass is not a renewable energy solution and these proposals (pyroysis, gasificaiton, plasma arc and combustion) are the dirtiest forms of energy production releasing GHG’s and contributing to climate change. I don’t believe this is the sort of industry your group would knowingly support as it runs counter to your aims. Alliance for a Clean Environment Inc.
EMRC have pointed out to me that their pyrolysis plant plans are still subject to environmental approval. I entirely agree that this is not the best use for wood products and have suggested to the EMRC that burning them for power should be the LAST possible option for their use. The EMRC have said that they used to sell woodchip material to Laminex for use in chipboard but that this contract fell through. I have suggested that they try and attract chipboard manufacturers to their site to set up a local business. At the moment the EMRC is looking at selling shredded wood as animal bedding, again not ideal but at least it has composting possibilities beyond that life. 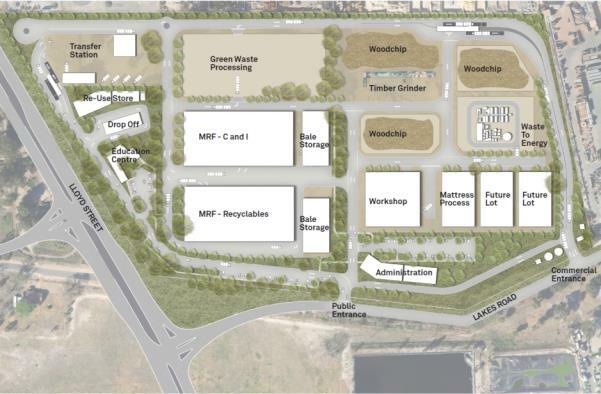 The EMRC claims that the proposed pyrolysis plant will only be using dry wood waste. The gasification of plastics and general waste is an entirely different matter. I have not seen any data that suggests that the EMRC proposal would release dioxins in to the atmosphere. It should produce significantly fewer toxic emissions than home wood heaters. This is definitely not my preferred form of power generation, (see my blog post on the 100% renewable energy forum) but I would place it well above coal in terms of being a renewable resource. It also has the benefit of generating power at the fuel source (waste collection centre) and supplying electricity to a local area rather than transmitting it hundreds of kilometres, with associated losses. At the moment the EMRC is also looking at selling shredded wood as animal bedding, again not ideal but at least it has composting possibilities beyond that life. TTG does not ally itself with any other organisation but we do try to keep our local community informed when we have information and also encourage government and business to take positive steps toward a sustainable future. The EMRC could send the woodchip to an Anaerobic Digestor and make compost out of it and then capture the methane for energy. This is a much more sustainable model and one that they have approval for already so makes much more sense. The best use of this resource though is to reuse it. I wonder if the EMRC pursued other companies to further this principle of the waste hierarchy? There are definately exit gases involved in any pyrolysis technology which will contain dioxin (and many other harmful gases) and it may be so that the levels are low…but as Dioxin is a Persistent Organic Pollutant I would argue there is no safe level for POP’s emissions, especially near residents. If the dioxin is not contained in the exit gases then it will be in the biochar and the toxic residues in biochar are a real problem that has not been resolved yet meaning that it is not a proven agricultural benefit and could represent a major contamination risk. If you haven’t seen any data about dioxin emissions I would ask for them because this technology operates elsewhere in the world and is known to emit dioxins. I am also very concerned that waste wood has been treated and may include pesticides, CCA, Low Organic Solvent Pine, synthetic pyrethroids, gluelam and salts, all of which provide the pre-cursers for the generation of dioxin, furans and bromines. As I said it is the dirtiest form of energy generation.Given the technology operates at temperatures that are known to generate dioxins this makes the emissions a significant environmental health and justice risk for the Hazelmere community and surrounds. Comparing energy from coal to energy from waste is misleading as coal is not renewable and such comparisons should be made with solar and wind to be fair, if it is claimed to be renewable energy. In fact incineration (including pyrolysis) produces more GHG’s than coal. I am certainly not advocating for coal energy but waste to energy is as bad and in some areas worse than coal. If this technology was compared to real renewable energy such as solar and wind then it would compare badly. Also the claim that it will produce significantly less emissions than wood heaters is also misleading. I assume you are referring to a comparison of all wood heater contributions in WA? Wood heaters are considered a diffuse emission source whereas this plant will be a concentrated point source of emissions with 11000 tonnes of waste wood processed per year. This is a massive amount of material containing toxics that will release its waste into our airshed in an area that is already affected by BGC’s asphalt plant and Brickworks emissions. The greatest risk though i think that is when such technologies are approved and established it is very difficult to close them down if they breach their licences. In fact i am not aware of any industry in WA that has been closed down for breaching air quality standards. The standard regulatory response in WA is to cover it up and deny the breaches and that’s even if they are identified in the quarterly monitoring reports that won’t be released publicly until some time well after the damage is done. We just do not have a robust regulatory framework in WA for stack industries that will ensure compliance with health protective standards (which are also insufficient). The risk will be that they will run out of waste wood and because the MRF centre will be on site it will be very easy for other wastes to be directed into this plant and especially if we are legally committed through contracts to keep the plant operating. This is the real lived experience of communities around the world who are burdened with such technologies. Financial risk, polluted environments, undermined recycling and adverse health impacts. I think it is imperative that we learn from their experience and heed their warnings, before we inflict such burdens on our own communities. Our organisation has some expertise in incineration technologies, Dioxin and chemical regulation as well as 25 years of environmental health and justice campaign experience and work at a national and international level on these issues. As such we are always happy to provide presentations to community groups and empower communities to defend themselves.